FORESTHILL, Calif. (KCRA) — A 300-acre wildfire near Foresthill in threatening 400 structures in Placer and El Dorado counties, Cal Fire said Tuesday night. At least 100 homes in Placer County were evacuated Tuesday due to the steep and inaccessible terrain. "This fire wasn’t immediately threatening the homes," Cal Fire spokesperson Daniel Berlant said. "But, because this community is a one way in, one way out, we want to make sure the residents, especially on the southern end of this subdivision, are evacuated." Cal Fire closed Nugget Drive and Oakwood Lane. We have several new policies for 2016, and I will present them in this Eblast so that you may properly prepare. IF NOT YOU, WHO? The first policy relates to cleaning up after the riders as they proceed through the ride. Many riders spend a few days in Auburn at the Gold Country Fairgrounds and then go up to Robie to start the ride. The fairgrounds need to be cleared of trash and manure before you leave. Many times that is done by the rider and has not been a big issue. The same attention to cleanup needs to be done when leaving the fairgrounds for the last time-- whenever that is. Tools and dumpsters are provided by the ride for you to use. It is the responsibility of the rider to leave a clean stall when finished. If you delegate that chore to a crew person, please double check that it has been done. Fees and fines assessed against Tevis are becoming a significant item in the ride budget. We want to avoid increasing costs wherever we can; avoiding the payment of fines is an easy way to do that. Our thirty-six mile vet check at Robinson Flat is a pristine high-mountain camp ground 364 days of the year. WSTF is required by our USFS contract to remove all hay and debris from the grounds before we leave the area. We are requiring riders to leave the area clean by placing all manure and leftover hay in the bins provided. Vet Check management will be there to remind crews to take an extra few minutes sanitizing their crew area of debris and will expect cooperation. Volunteers are vital to the success of this event and have many responsibilities. Asking them to clean up after 180 horses and their support crews should not be one of them. This is how we lose these vital people from year to year. If you haul it in; haul it out. At Robie Equestrian Park, the protocol is to pick up or spread hay and manure. We understand that riders may station crews in advance of the ride, ie, you are at Robie Equestrian Park, but your crew members meet you for the first time at Robinson Flat or Foresthill. You must make sure your crew knows what is expected at each vet check even if those people cannot be at the preride briefing at Robie Park. Again, it is the rider's responsibility to inform their crews of the policies of the ride at each stop. It is also a ride policy that riders and crew shall not save spaces ahead of time at Robie Equestrian Park or Foresthill. Parking and crewing locations are strictly first come, first served. One of the reasons for this is that it is unfair for locals to have the advantage of setting up in advance. The Robie Foundation Board feels so strongly about this that they have written possible significant fines into our agreement to use the park. As a result, Tevis management has no room for negotiation on these issues with nonconforming riders. Drop your vehicle on Thursday after 10 am at Foresthill Mill Site or Fridaybut do not set up your pop up shades until you arrive to crew at the site. If you need to leave you vehicle in Auburn in the Sacramento Street parking lot, you need to leave it at the far South end of the lot. Doing so allows the public to use the North end of the lot as they need to come and go more often. Just a reminder that no horses are allowed in the Sacramento Street lot. Please unload them on the dirt through the participant's gate at the South end of the lot. Now to shift gears somewhat. The blood draw at Robinson Flat will be only for research purposes this year. It is a blind study; you will get your results after the ride. This will allow the research veterinarians to continue their study and will only take a couple of minutes to draw your horse's blood, while waiting in line to see the control judge at Robinson Flat. The Pen 1 and Pen 2 seeding system will be used again this year. The selections for pen one are made a few weeks before the ride based on the horse's ride record. The horse's record is the basis for the seeding-- not the horse and rider's record. If you think your horse might qualify for Pen 1, please apply by the deadline. In most years, horses need to average a 20 to 25% placing to be allowed to start in Pen 1. It is very challenging to meet the mathematical requirements to qualify. Occasionally a rider will stop to help an injured rider or horse during the ride. This might cause the rider to fall behind the cutoff time at the next few stops. The ride committee is implementing a procedure that would allow the rider to make a request from a Head Volunteer or Cup Committee member for an allowance to exceed the cut off times at the next stop(s). The HV or Cup Committee member needs to radio in to Net Control with details of the request. The Ride Director and the Head of the Cup Committee are the only people authorized to grant the request. The Cup Committee member or HV who initiated the request will flag and sign the rider's card with the approval of a time extension. The 5:15 AM finishing time will not be extended under any foreseeable circumstances. This year the cutoff time at Chicken Hawk/Piper Junction has been eliminated entirely. This information is vital to the success of your Tevis experience as well as management's need to fulfill many agreements and restrictions communicated to us in our permits and contracts to conduct the event. We will continue to publish this information in multiple settings to be sure everyone gets the word. Please read your rider epacket, the rule book, the EBlasts, the Forum and the website for ways to share information with your support crews-the unsung heroes of your ride. The Tevis ride is a rugged, historical adventure conducted in a 21 st century world. We look forward to seeing your earn your buckle and wish you all the best in your remaining weeks of training. Parker, Co. - The Organizing Committee of the 2016 Adequan/FEI North American Junior & Young Rider Championships presented by Gotham North (NAJYRC) has announced that due to insufficient international entries, the Individual and Team Endurance Championships will not be held this year. Following the close of the Entry in Principle, the FEI requirement of at least two National Federations represented with teams was not met in order to run the endurance division as a Continental Championship. After exploring options available to host a different level of FEI competition, endurance will not be held due to lack of interest. The NAJYRC will be held July 26-31 at the Colorado Horse Park in Parker, Co.
For more information on the event, please visit youngriders.org. For the past 50 years Jesse Caswell has dreamed of completing The Tevis Cup endurance ride. 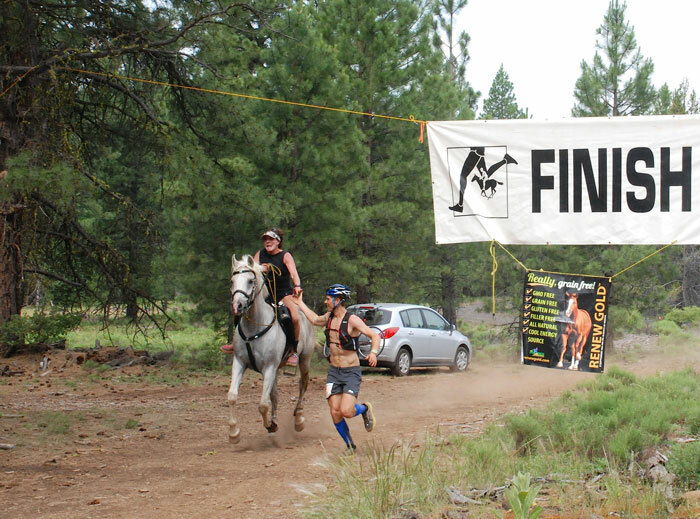 The race tests the stamina of horses and riders who attempt the 100 miles of steep, rugged mountainous terrain from Lake Tahoe to Auburn. Each year, nearly 200 competitors attempt the grueling course, but only about half of them finish. In 2012 Caswell nearly completed the course, but he had to drop out because his horse could no longer go on. But this year may be Caswell's best chance at conquering the course, one of the oldest and most prestigious endurance rides. The 75-year-old Redding man has a new horse and he and his horse appear to be in top shape, friends and supporters say. "Jesse is one to watch, and he will do better than people expect," said Chuck Stalley, Tevis Cup race director. "He takes to it like a duck to water..."
"All the World's His Stage," a profile of endurance rider Rusty Toth which appeared in Chronicle of the Horse Untacked magazine, won top prize in the annual American Horse Publications contest over the weekend in Florida. Freelance writer Marsha Hayes spent time with Toth last year, exploring the role that art plays in equine competition. Her article touches on the spiritual connection found between human and horse. Toth is a retired ballet dancer and avid endurance rider. He won the Tevis Cup in 2013, and the Haggin Cup in 2012. The article placed first out of 18 entries in its category. Judges commented, "This article approaches the very high quality that has been a hallmark of National Magazine Award-winning profiles in Sports Illustrated magazine." A special endurance ride will be taking place locally this weekend, in honour of a husband and father who loved the sport. Ron Janzen passed away from cancer in 2008. The following year saw the inaugural Ron Janzen Memorial Ride, an endurance ride that has taken place every year since and will continue the tradition this Saturday. Janzen said the ride is one of the largest in the province, not surprising when one considers Ron’s standing in the community of endurance riders. GREEN RIVER – Green River continues to celebrate past successes and accomplishments as they recently announced the 2016 Green River Hall-of-Fame Class. The class includes a three-time state championship cross county team, a former BYU National Invitational Tournament basketball champion and a RMFAC Football champion. This year’s banquet will take place Sept. 10 at the Green River High School. “I speak for the entire HOF Selection Committee when I say that it is an honor to take part in this process,” Green River Athletic Director Tony Beardsley said. the AERC Protest and Grievance Committee. I'm not going to pretend to be neutral and unbiased. I know too many fine things about the Summers to be impartial, and I feel much too strongly to remain silent. In fact, I am going to post my entire open letter to the AERC Board (it's down below). Ride and tie may just be the coolest sport you’ve never heard of, and you can get involved right here in California. This year, the Ride and Tie World Championships will be held at the Cuyamaca Rancho State Park in Southern California, on July 2. The sport is a mix of endurance horse riding and trail running. Teams comprise two runners and a horse, and races are complete when all three team members cross the finish line. “You need to be a fairly good rider. This is definitely not riding around an arena. This is out in the wild.” says Ben Volk, media secretary for the Ride and Tie Association. After competing in an endurance riding event in Utah this spring, Elroy Karius and his horse, Jolly Holiday, were on their way home when the unexpected happened. While travelling northbound on Highway 97 near West Kelowna, Jolly Holiday, inside the horse trailer, became entangled with a sliding metal latch and was in danger of being fatally injured. Karius stopped the truck and tried to free his horse but, on his own with no assistance, the prospects didn't look good. The time spent with your horse is precious. For those who compete in equestrian sports, those few minutes in the ring may not satisfy your craving to spend more hours in the saddle. If you’ve been longing to hit the trails and really ride, it’s time to discover endurance riding. With introductory, fun rides of 10-15 miles, and then the competitive distances of 25-35 miles (limited distance) or 50-100 miles (endurance distance), there is no doubt this sport will bring you and your horse closer in partnership. The nonprofit American Endurance Ride Conference, now in its 43rd year, welcomes riders of all ages and equines of all breeds. Most people with a reasonably conditioned horse or mule will be able to complete a 25-mile ride within the allowed six-hour time frame. “And they’ll have a fun time, discovering great trails and meeting other endurance riders and their horses,” said AERC Executive Director Kathleen Henkel. AERC rules require that a prize be given to each finisher — it can be anything from a photo taken during the ride to a T-shirt or certificate or handcrafted item. Often there are prizes for winners in varying weight divisions and for the horse deemed best condition in each competition of 25 or more miles. Sound intriguing? AERC has reissued their 16-page Discover Endurance Riding booklet, which is available free upon request at 866-271-2372 or www.aerc.org/AERC_InfoRequest. Shamrock Pioneer – run on the historic trails of southeastern Wyoming, where Native Americans, pioneers and outlaws once roamed the West. This picturesque and challenging ride has a 30-mile and 55-mile option each day, July 1-3. Bandit Springs – Held in the Ochoco National Forest in Oregon on July 9 and 10, this ride offers distances ranging from 25-75 miles. Vermont 100 – One of only a few rides where equestrians share the trails with ultrarunners, this long-time ride is held in West Windsor on July 16. Besides the 100-mile ride, there are 50- and 75-mile options. Pine Tree – This Maine ride has five days of riding, with distances of 25-55 miles,August 9-13. Trails run along and across the Saco River, near Fryeburg. And, of course, the ride that started it all and remains THE ride that draws more people to the sport of endurance riding than any other: The Tevis Cup (real name: Western States Trail Ride 100). Begun on a dare in 1955, the riders and horses traverse the Sierra from Squaw Valley to Auburn in a true test of horsemanship and stamina. Taking the first step towards entering the Tevis—or a 25 mile LD ride—is the easy part. AERC has extensive educational materials (including its own YouTube channel) and a mentoring program that can match up new riders to experienced veterans of the sport. And the rider’s partner? While Arabians and part-Arabians are numerous, the sport is seeing a rise in the number of gaited horses, Paso Finos, and other breeds. All equine breeds are welcome, and it’s typical to see Mustangs, Appaloosas, Quarter Horses and even Icelandic ponies at AERC rides. All competitions are run by a ride manager and overseen by veterinarians, known as control judges, who check over the equine athletes before, during and after the ride to be sure each one is “fit to continue” as they make their way along the course. Hundreds of endurance rides are held annually around the U.S. and Canada, with everything from small, low-key rides to ultra-competitive races. The nation’s top riders are gearing up for the national championship ride to be held September 8 and 10 in Utah’s Antelope Island State Park. AERC’s monthly publication, Endurance News, includes an extensive ride calendar and awards standings each month as well as education articles and features. New members can join AERC at www.aerc.org/NewMbrReg or by phoning the AERC office, located in “the endurance capital of the world” — Auburn, California—at 866-271-2371. Mary, Mary, quite contrary, this article is not. Meet Mary, Mary, extraordinary, your neighbor, Mary Kautz. It’s fun to discover how people land in Philomath. Truth is most of us mispronounced the name of our town the first time we came over the hill into city limits. For that matter, who dares voice texting the word, Philomath? My Bluetooth freaks if I so much as mention the word. Which I’ve learned to outsmart by simply saying, “Where home is,” instead of “Philomath” when texting. Mary’s not so unlike yourself. She didn’t set out for Philomath and yet it has tattooed itself upon her heart. She’s here for good having recently purchased her forever home right here in, you know — where home is. Mary graduated high school in Ohio and began like most 18-year-olds exploring the world where mom and dad are not. She headed west to Idaho, accepting a working student position in a horse training and breeding facility. The following summer she moved to California taking a similar position. Fast forward to Mary meeting Scott, who planned to attend Oregon State. The NW began its tug on Mary when they came to check out the area. “I really enjoyed the West. I just decided that I belong in the West, I don’t belong in Ohio. There are no mountains in Ohio,” said Mary. Mary also likes the culture here. “HORSES!” She will say with a beautiful grin as her large brown eyes sparkle. Mary eats, sleeps and breathes horses. As a child, Mary had a collection of “My Little Ponies.” By age 8, she became obsessed with the real thing. She wondered if she might have a career as a professional athlete, or a riding athlete, but Mary decided that being a jockey wasn’t for her.